First graders at E-M Elementary had a visit from Mr. Larry Light, a former beekeeper and Mikey Bartu's grandpa. He shared with us a lot of information about honeybees. The first graders were given booklets with pictures and bee facts and coloring pages. 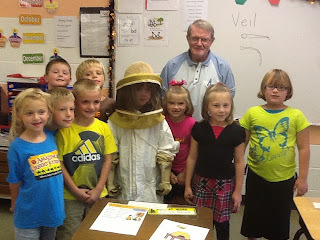 The highlight of the day was when Liberty Johnson got to dress up in Mr. Light's beekeeper uniform.